What happens when profit motive collides with good science? I dunno, I'm on vacation! 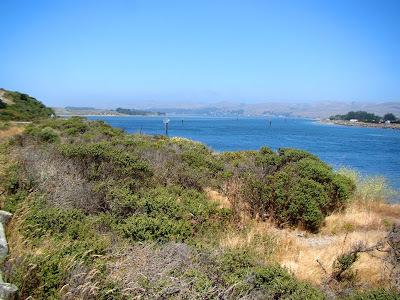 We escaped the heat of the Central Valley yesterday by taking a drive up Highway 1 from Bodega Bay to Fort Bragg. 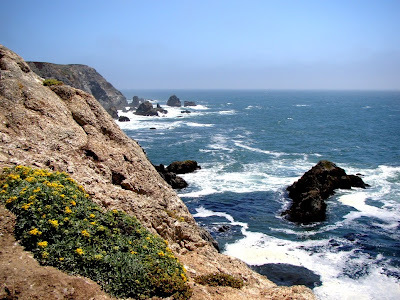 Bodega Bay is formed by a prominence called Bodega Head that would otherwise be an island, except that sand has linked the island to the mainland and in the process formed a small protected harbor. The Head is a beautiful stretch of coast, with some stunning seacliffs and sea stacks on the Pacifc side. The rocks are made out of granite! 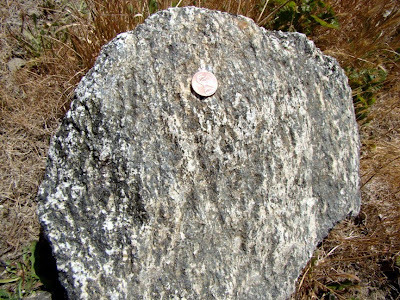 Or, to the geologists eye, a granitic gneiss (note the lineations in the boulder above). These rocks have undergone some stress. The granite seems a bit out of place considering the big California picture; we tend to associate granite with the Sierra Nevada or Southern California, not the North Coast. Which brings me to this scene, from the bay side of the Bodega Head. 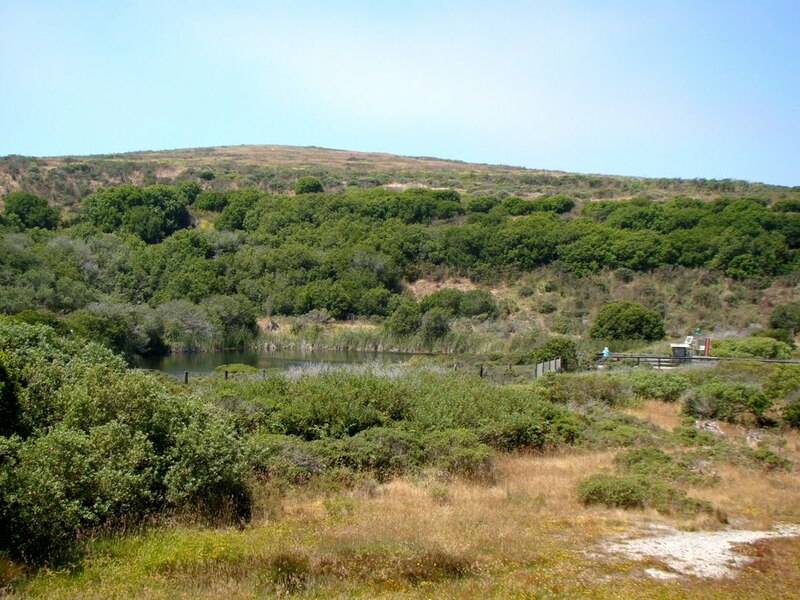 There is a quiet little freshwater pond, surrounded by thick vegetation. There was a gathering of egrets in the trees, and despite the season, wildflowers were in abundance. It was a serene setting. What wasn't clear from the ground perspective is the pond is rectangular. It's artificial, having been dug out of the solid granite, but it was abandoned for some reason and left to be reclaimed by nature. Groundwater maintains the water level. So what happened here? It turns out that in the late 1950's, an electric utility wanted to build a nuclear power plant on the site. 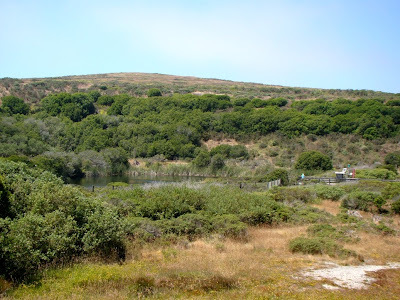 The granitic rock would provide a firm foundation, there was a plentiful supply of water for use as a coolant, and the site was close enough to the Bay Area that transmission infrastructure costs could be kept low. What could go wrong? So they dug this hole to prepare the foundations for the nuke plant. What could go wrong? 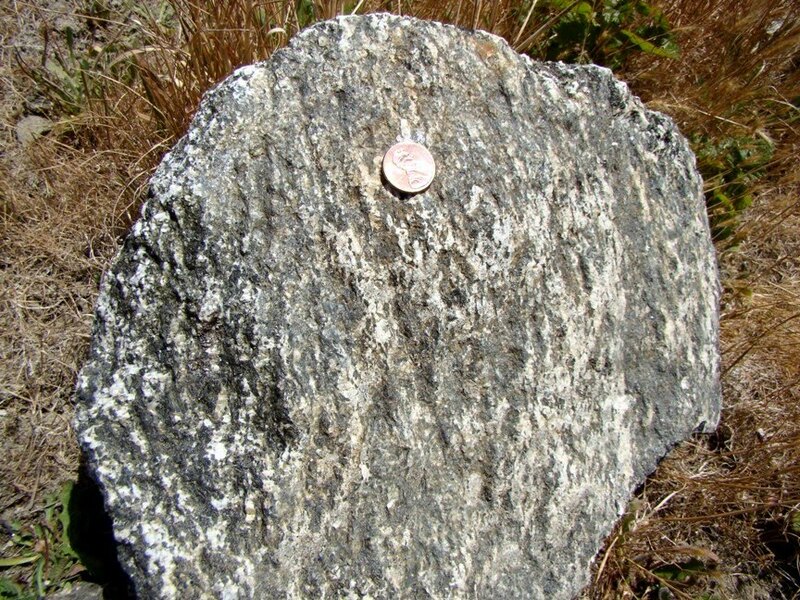 We need to ask again what granitic rock is doing here. It is indeed out of place, for this rock originated to the south. At least 200 miles south! It was split off and carried north, 10-20 feet at a time during major earthquakes. There have been perhaps 100,000 of these earthquakes in the last 15-20 million years. As we look across Bodega Bay in this last photograph, we come to realize that Bodega Head lies on the Pacific Plate, while the town of Bodega Bay lies nestled on the North American Plate. The San Andreas fault passes within a few hundred yards of the chosen site for a nuclear power plant! It is said that local opposition led to the abandonment of the project. Maybe. I've heard that they found evidence of active breaks in the granite within the pit. 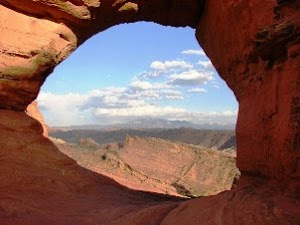 In any case, it never got built, and today the locals refer to the pond as the "Hole in the Head". The Other California is a series of blog posts highlighting the kinds of places and features you don't find on the postcards of our beautiful state. Appreciate your blog, always find new interesting facts about our state. Keep it up! It takes all kinds to think of something like building a nuke plant on the fault. Have a great, cooling, vacation. We enjoyed 60s at Cedar Breaks yesterday. Garry, I have some articles on the fight against PG&E and the people who led it. If my memory is correct it was led by one very colorful local woman. The location of the plant was (I Think) is where the UC Davis research lab is located after PG&E abandoned the project the gave the property to the UC system. It was Manny Bonilla of the USGS who was prime instigator of the fight against PG&E on the scientific side. Scientists have an obligation to speak up when they see such a staggering mistake being made. 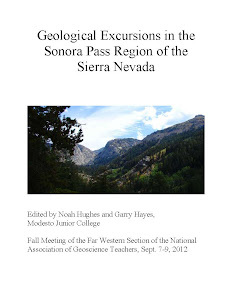 New Book out on Yosemite Geology!